Lovely boat in really good condition. Legendary build quality that Dehler are renowned for. Responsive and stable, she is a real joy to sail. 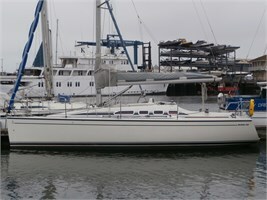 Good for families and friends to cruise in and fast enough to give a good account of itself for those who wish to race. 'Persuasion' is well equipped with a good wardrobe of sails and other features for living on board. Overall I would say the yacht is a good mix comfort and performance. A boat to suit all occasions. Excellent Ullman laminate mainsail, full length top battens, slab reefed with stackpack and lazy jacks. Sobstad/Elvstrom 135% tri-radial laminate genoa (padded luff) in excellent condition. Westaway spinnaker in good condition. Elvstrom dacron mainsail, very good condition. Elvstrom dacron self-tacking headsail, very good condition. There is a self-tacking track fitted by Dehler (it is removable) Furling headsail sun sleeve (2015) Lewmar mainsheet track Boom support vang. 4 Lewmar self tailing winches. Shorepower/battery charging system with twin socket outlets, Galvanic isolator fitted (2017) Garmin 520s chart plotter in cockpit (2013) Icom DSC/VHF with cockpit speaker (2014) LED navigation lights Raymarine ST60 Wind/Speed/Depth. Eberspacher heatingwith 3 outlets (2014) Fully gimballed Oven/Grill/Hob (2009) Compressor coolbox. H &C pressurised water system.